BACKGROUND This survey of part of Lake of the Woods County (the Baudette area) in northern Minnesota represents a westward expansion of the deep overburden characterization (glacial till sampling) program begun by the Department of Natural Resources in 1985. The goals of the program are to detect regional-scale anomalies of gold and other metals in the glacial overburden, and to develop the stratigraphic framework for understanding those anomalies. The Baudette area, near Lake of the Woods on the Canadian border, is covered by deep glacial overburden (> 100 feet), and is underlain by an attractive, but relatively unexplored, gold terrane made up of structurally-deformed, volcanic associated rocks of the Wabigoon granite greenstone belt. The deep overburden hides the bedrock and hinders mineral potential evaluation of state lands. Report 280: Regional Survey of Buried Glacial Drift, Saprolite and Precambrian Bedrock in Lake of the Woods County, Minnesota. Please note: Best results in viewing this report will be obtained by saving the file to a location of your choice and opening with Adobe Reader or Acrobat. Some report information may not display as a result of opening with Acrobat directly from a web browser. This report has been scanned in and applied with optical character recognition (OCR) which electronically translates the scanned image printed text into machine-encoded text. This allows users to then search the document by keywords in Adobe Reader or Acrobat software. Plate 1a: All Columnar Sections Hung by Elevations (see legend on page B-2 in Appendix B). Plate 1b: All Columnar Sections Hung by Elevations (see legend on page B-2 in Appendix B). The following zip file contains information for twenty-one townships in the Baudette area of Lake of the Woods County in northern Minnesota, as described in the Minnesota Department of Natural Resources (MnDNR), Division of Lands and Minerals Report “Regional Survey of Buried Glacial Drift, Saprolite, and Precambrian Bedrock in Lake of the Woods County, Minnesota – Report 280,” published in 1991. Each folder contains data from the report in a different format. The data is presented in its original format, in a Microsoft Access database, dBase IV file format, and ArcGIS shapefiles/feature classes inside a file geodatabase. 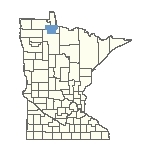 The State of Minnesota makes no representations or warranties express or implied, with respect to the use of the information contained herein regardless of its format or the means of its transmission. There is no guarantee or representation to the user as to the accuracy, currency, suitability, completeness, usefulness, or reliability of this information for any purpose. The user accepts the information “as is." The State of Minnesota assumes no responsibility for loss or damage incurred as a result of any user’s reliance on this information. All maps, reports, data, and other information contained herein are protected by copyright. Permission is granted to copy and use the materials herein for any lawful noncommercial purpose. Any user of this information agrees not to transmit or provide access to all or any part of this information to another party unless the user shall include with the information a copy of this disclaimer.